The world’s first truly versatile Pocket Mobile Companion. 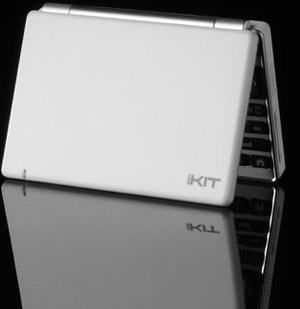 Think of the iKIT as a mini laptop without the complexity. It’s built like a laptop with a rugged processor and Linux based operating system, but that’s where the comparison ends. It’s the ideal chat, email and internet accessory because it contains all the essentials without the size and cost. With several key multimedia features like music and video as well a video camera for VoIP video conferencing and you have the ultimate mobile-communicator. Who said you need a laptop to do the things you like to do most? iKIT is designed to be used in WiFi settings like your home, office, hotel or Internet café which makes communicating convenient and inexpensive. In addition, its Bluetooth capabilities allow it to pair with almost any data enabled mobile phone to access websites, email and chat networks – iKIT enables you to keep your phone for SMS and phone calls and pull out the iKIT when you want to get into serious stuff. Pair the iKIT to almost any small handset with data capability and away you go. Alternatively, connect it to your WiFi network at home or at work to surf the web, send and receive your emails, chat or video-chat with your friends without added data cost. Download movies, pictures or music to iKIT's removable micro-SD card to enjoy full multimedia wherever you are. Best of all, iKIT comes at a price anyone can afford and it’s simple and easy to use. All you need is a data-enabled mobile phone or WiFi access. Forget about complicated menus and touch screens that break or just get messy. Forget about costly data plans and service fees. iPHONE users eat your heart out! iKIT has one main menu screen and a few hot buttons that make it easy to access key functions. Its rugged, folding design helps protect key the screen and keypad from the rigors of daily life.